I was able to get some pinto beans cooked up today. When I unpacked my boxes, I found many, many beans of all sorts. I buy them in bulk, usually in 25 pound bags. We enjoy eating beans, and I was eager to get some of them into meals. 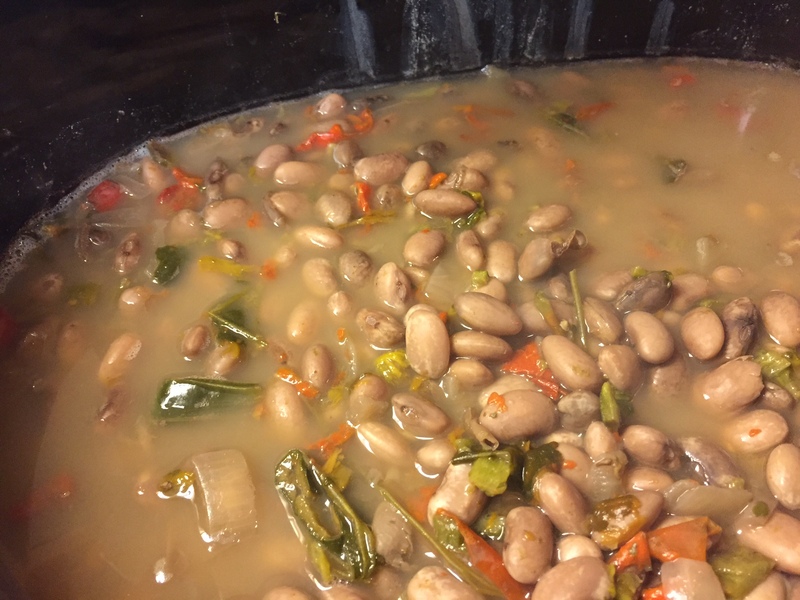 I soaked about 1/2 gallon of pinto beans over night in plenty of water. I used my slow cookers so that they could just cook away while I visited with my good friend who was visiting today. 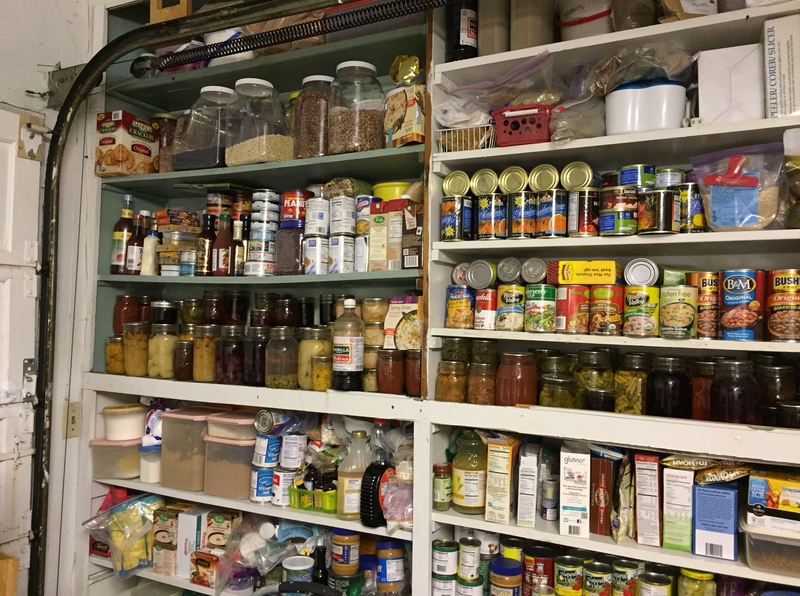 I’ve got the food storage unpacked and organized now, and am eager to start using it. I’ve missed having all these ingredients at my fingertips. My freezers are still not here, as the plugs-ins are not finished, yet, in the shop. There are many more containers of dry beans that are not showing up in this photo. I have a couple of shelves dedicated to home-canned items and the rest will be stored in the shop and brought in as needed. Rob has 1 of the 2 shelves needed already built out there and we spent a morning unloading boxes to fill it up, making those jars accessible to me! I made one slow cooker full of chili. It turned out great. I used a jar of tomatoes I unearthed, a pint of beef broth, along with celery, bell peppers from the garden, onion, beans, salt, pepper and chili powder. It turned out great and we scarfed a lot of it down at dinner. The second one was filled with peppers and beans for refried beans. These beans, peppers and onions are waiting to soften a bit more, and then I will blend them with my immersion blender. I put in several peppers from the garden. I always use whatever I have on hand, fresh or frozen, along with some onions–red, yellow or white. This is a mixture of Jalepenos, Holy Mole and Italian frying peppers. They are pretty mild this year, but once I blend them, the beans have a wonderful flavor. Obviously, some batches are quite a bit spicier than others, but I anticipate that this batch will be quite mild. My children love homemade refried beans. They will eat them several times a week if I let them. I try to keep some frozen at all times. The way I make them is a lot runnier than the ones in a can, and they have so much more flavor, in our opinion. I don’t have much freezer space in the small one over the fridge, so I didn’t make a huge batch. This will keep everyone happy for a few weeks, though. The third thing I did was boil up the rest of the soaked beans in water, with salt, on the stove in a pan until they were soft. We ate some of those in tortillas for lunch, with cheese and taco sauce. There were 2 bags to freeze for later. I will use them in recipes that call for beans instead of opening a can. It was a rewarding, and yummy Saturday. 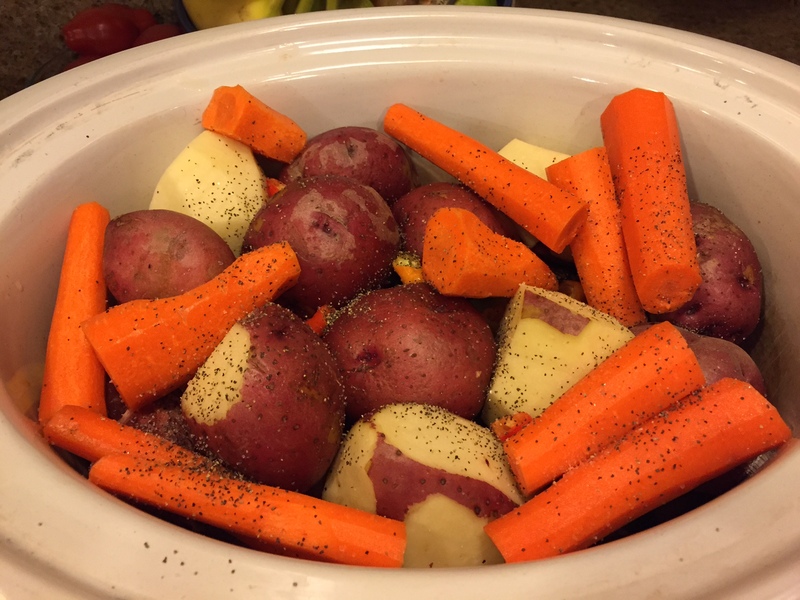 By using the slow cookers, I had a great visit with my friend, and got economical, yummy meals at the same time. 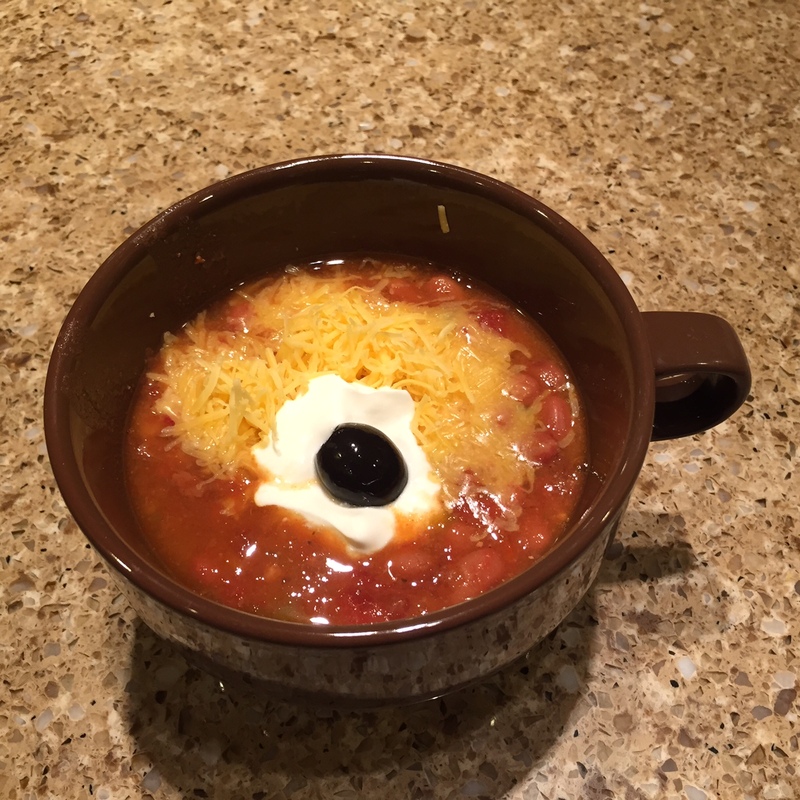 Yesterday, I decided to make taco soup in the slow cooker. 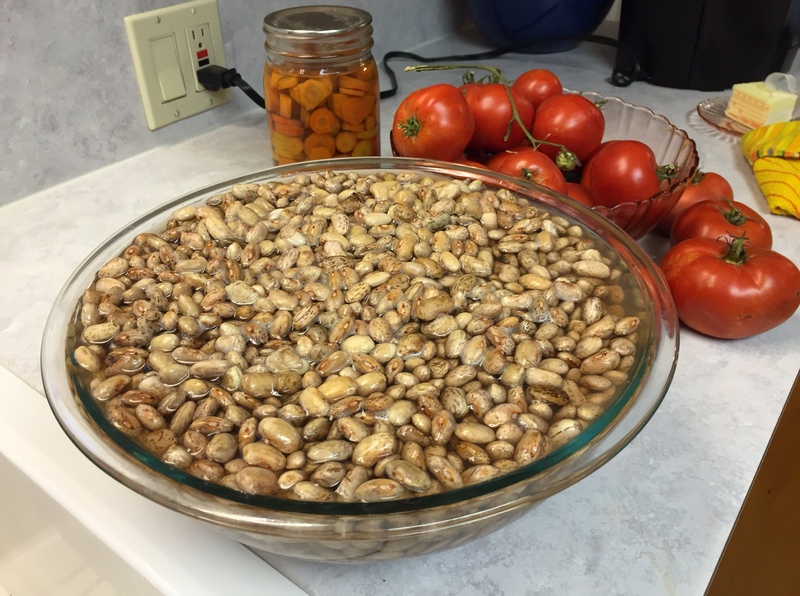 It is heavy on the pinto beans, as my husband got a 50 pound bag last summer for only $22. I spent quite a bit of time trying to burn a slash pile with the family, and we were all glad for a hot meal at the end of a long afternoon. Sadly, it did not burn all the way up. We got some of it burned, but not all. Bummer. The soup was still excellent. 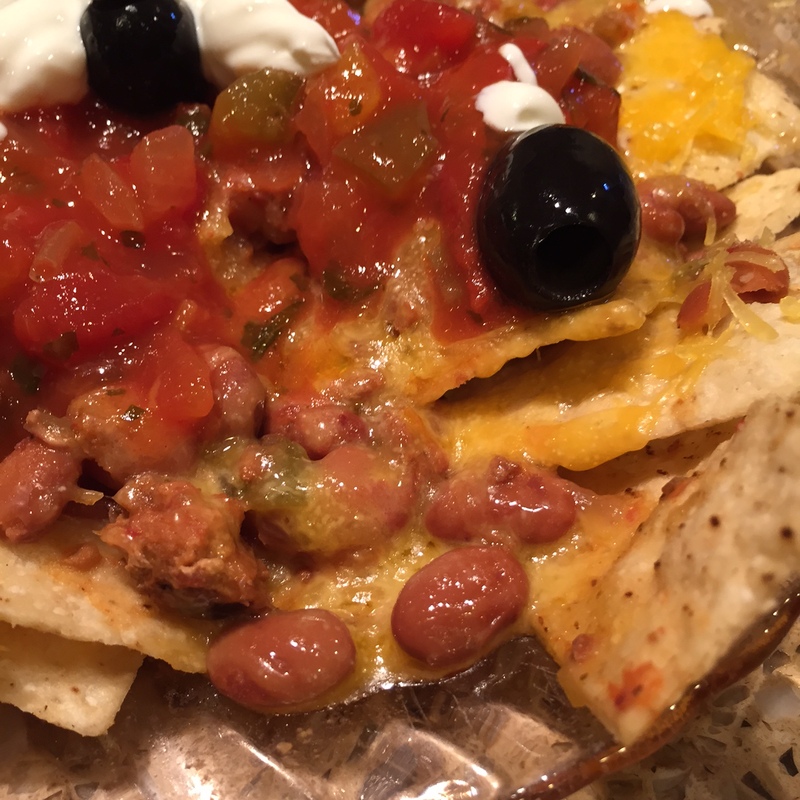 This turned out quite thick and some family members chose to fish out the beans and turn it into nachos instead. This is what it looked like as a nacho. They did drain out the liquid from the beans before they dumped it on the chips. We get the mega-bag of chips from Costco, divide into zip-topped bags, and can enjoy corn chips for a reasonable price, without them getting stale, for several weeks. Today, I had another busy day. We were trying to burn slash piles from the logging that was recently done on our property. I wanted to take a meal to friends this evening, so I chose to use my trusty slow cooker. I thawed a chuck roast overnight. This morning, I put the roast into the slower cooker. The roast was sprinkled with onion soup mix. I buy it in a large bulk package from Azure Standard and just dip out what I want with a spoon. It tends to clump up after a while, so if it is that way, I break it apart. It still works fine. One package can last me for several months, and it tends to draw moisture, especially when the zip-topped bag doesn’t get closed well:) I got some of the 50 lbs. red potatoes I recently bought for $10. Red potatoes tend to go bad sooner than I’d like, at least around here, so I’m pretty committed to using them up in a timely fashion. I cut off any bad or ugly spots, but just left the peels on the rest. I peeled a bunch of carrots and threw them on top. 3 small “squiggly” peppers were in the fridge, so I cut them up and added them. I sprinkled it all with a little salt and pepper. I poured in about 1/2 cup water, and was good to go. I turned the cooker on high for 2 hours to give it a jump start. I wanted to take the meal mid-late afternoon, so I wanted it to cook a little faster than normal. Then, it was turned down to low for about 6-7 hours. It was very easy, tasty, and much appreciated when Rob took it over to them. Exactly the kind of recipe I like to make on busy days! We rounded out the meal Rob took over with green salad, and a bunch of items that the 4Hers cooked yesterday–some stuffed shell pasta, stuffed sweet potatoes, and Dutch oven peach cobbler. 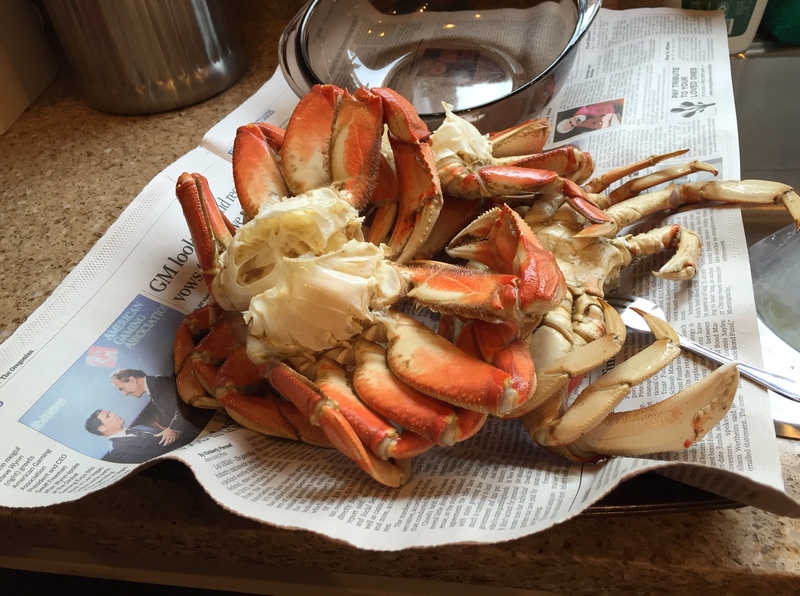 Our family ate more of the leftovers, plus some of us ate Crab Louie from 4 Dungeness crabs friends sent over from their recent catch. It was also nice to be able to use up so many leftovers from the fridge–it saves so much money! 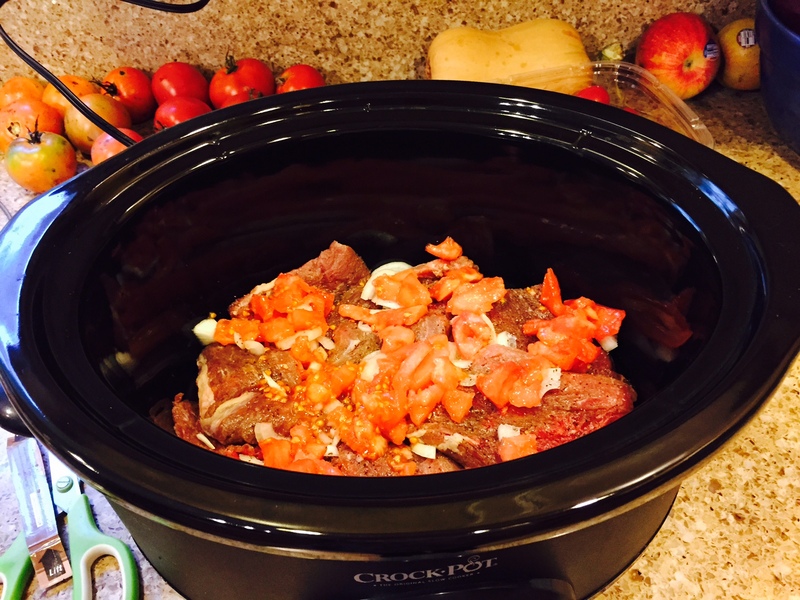 When I need dinner in a hurry, I turn to my slow cooker. This happens several times a week, because I am always in a hurry! Recently, someone gave us some round steak. 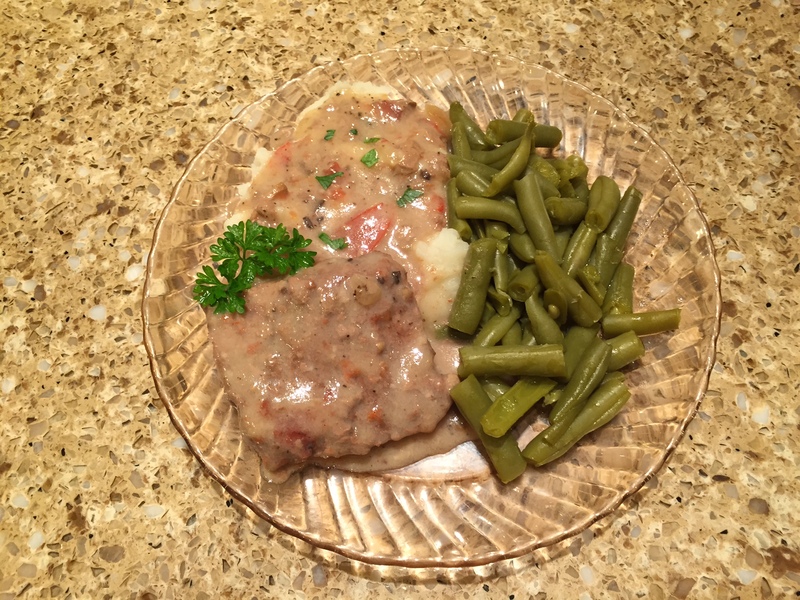 So, I decided to make Swiss Steak. I cut the steak into cutlets and laid them in the bottom of the crock pot. I seasoned it with salt and pepper. I chopped one small onion and 2 tomatoes onto the top. I still have a few tomatoes left from the garden, so I used those. When I don’t have any from the garden, I use canned. I put a carton of cream of mushroom soup on top and turned it on to low for 8 hours. My sister had ordered a case from Amazon, and shared several cartons with me. I can’t tolerate any gluten, so the Pacific Foods brand is the one I use. That evening, we had the Swiss Steak with cauliflower from the huge box a friend gave me a couple of weeks ago. Tonight, I thickened the juices with sweet rice flour to make gravy and we had the rest of it with mashed potatoes and home-canned green beans. I’m looking for ways to use the 50 pounds of red potatoes I bought for $10 a week ago. I was delighted to get 2 dinners for almost free and they were really tasty, too.